People are always on the lookout of new features and updates related to the most advanced devices, especially by the giant industry leaders like Android and Apple Inc. as well. In this write up, we will be talking about the latest update related to the Android Wear SDK (2.2.0) which has been launched just recently. There are several enhancements, out of which most of them are related to watch face. It is certainly a new milestone in the Android development market. There is a very interesting addition to the Android Wear SDK in this latest release. A feature that is slated to be a part of upcoming release, i.e. Unread notification indicator for all watch faces has now been introduced. To add icing on the cake, customization of the above stated feature is possible with the Android Wear SDK 2.2.0. 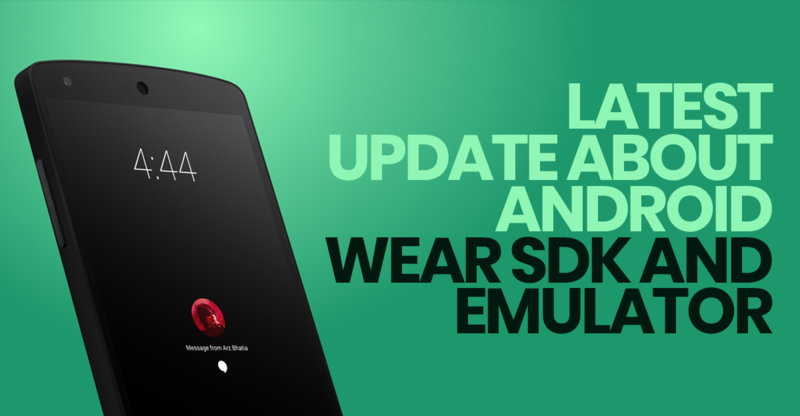 Currently, developer community has the access to this feature through SDK and emulator. This step was taken keeping in mind the importance of verification needed with regard the new feature. To further add to this, Microsoft is also rolling out enhancements to the ComplicationDrawable class and publishing based on Android Oreo, the final version of the Wear emulator. But what is Unread Notification Indicator by the way? We hold news for the developers in the Android applications development and Android Wear users as well. There are no second thoughts about the fact that Notification is a significant part of the Wear device experience. There should be something very simple and clean about the interface that should immediately notify the users of the device about the notifications. Talking about the current scenario, the developers of Watch face are able to have a look at the preview of this new notification feature by using the latest version of the emulator. Why are they using this feature is for checking the customization of the indicator via WatchFaceStyle.setAccentColor . We would also like to inform here that the color of the dot is white (default color) and the ring color as well as the dot color can be customized by the developers. Here are the 2 ways by which you can choose a design to fit the design of your watch face. If the design is not as expected, there is an option to change the colors by switching it off via WatchFaceStyle.setHideNotificationIndicator. 2) It is also feasible to show the number of unread notifications using WatchFaceStyle.getUnreadCount and to display the number in a way that fits the unique watch face.